"Now found exclusively at one well-known pizza garden in Gravesend, Brooklyn, this style of pizza was once found in neighborhood bakeries. This pizza is deceivingly light, crisp, and slightly spicy. Enjoy with a can of soda." Combine water and yeast in a small bowl. Let stand until yeast softens and begins to form a creamy foam, about 5 minutes. Combine flour and salt together in the bowl of a stand mixer fitted with a dough hook attachment. Pour in yeast mixture. Knead dough until smooth, about 7 minutes. Grease a large bowl lightly with olive oil. Form dough into a tight ball and lightly grease the top. Place in the bowl; cover loosely with plastic wrap. Let rise until doubled in volume, about 30 minutes. Mix crushed tomatoes and pizza sauce together in a bowl to make sauce. Grease a heavy-gauge rimmed 12x17-inch baking sheet generously with olive oil. Press dough into the bottom. Prick dough all over with a fork. 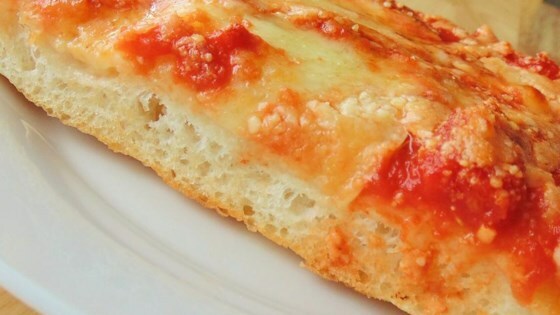 Arrange mozzarella cheese slices over dough; cover with 1 cup sauce. Sprinkle Pecorino Romano cheese on top. Drizzle remaining olive oil over pizza. Let pizza rise in a warm area until puffy, about 1 hour. Bake pizza on the center rack of the preheated oven until edges are very dark brown but top is not burnt, 15 to 20 minutes. Cool in the pan for 5 minutes before slicing into squares. See how to make a classic pizza margherita. Prepare dough in a food processor if preferred. Look for crushed tomatoes with no basil, puree, or citric acid added. OMG! This pizza is amazing I request this for a dinner party. You are going to die for it. Took forever to find a FLUFFY pizza dough, but it was worth the wait! it was absolutely amazing!